Director – Richard Fleischer, Screenplay – Stanley Mann, Story – Gerry Conway & Roy Thomas, Producer – Rafaella De Laurentiis, Photography – Jack Cardiff, Music – Basil Pouledoris, Miniatures – Emilio Ruiz del Rio, Mechanical Effects – Carlo Rambaldi, Makeup – Gianetto de Rossi & Jill Rockow, Production Design – Pier Luigi Basile & John Bloomquist. Production Company – Dino De Laurentiis Entertainment Group. Taramis, the witch queen of Shadizar, promises to bring Conan’s love Valeria back from the dead if he will conduct a mission for her – that of leading her niece, the innocent princess Jehanna, to locate a horn of sacred importance. Unknown to Conan, Taramis is planning to sacrifice Jehanna upon their return in order to raise the demon god Dagoth. Jehanna’s virginity needs to remain intact for the sacrifice and the treacherous Taramis has sent along her bodyguard Bombaata to ensure that Conan and his group of followers be eliminated once the mission is completed. Conan the Barbarian (1982), based on Robert E. Howard’s primal character from the 1930s pulp magazines, was a big success when it came out – indeed, it made a star out of Arnold Schwarzenegger in his first lead acting role. That success then mandated this sequel. Schwarzenegger, Mako, who played the sorcerer in the first film, and producer Dino De Laurentiis are back, although the sequel is without either the original film’s director John Milius or screenwriter Oliver Stone. The new director was Richard Fleischer. Fleischer had made some great genre films – Disney’s 20,000 Leagues Under the Sea (1954) and Fantastic Voyage (1966) – but by the 1980s was working as a glorified B-movie hack, turning out efforts like this, Amityville 3D (1983) and the subsequent Robert E. Howard adaptation Red Sonja (1985), all for Dino De Laurentiis. On script, Milius and Stone have been replaced by Stanley Mann, author of The Collector (1965) and Eye of the Needle (1981) and more tellingly of the likes of Damien: Omen II (1978) and Meteor (1979). More promisingly, there is a story from Gerry Conway and Roy Thomas – Thomas had written a number of issues of Marvel’s various Conan comic-books in the 1970s and Conway had worked on Marvel’s adaptations of Robert E. Howard’s King Kull character. Unfortunately, in employing comic-book writers and then handing the screenplay over to a hack like Stanley Mann what has resulted is a story that turns Conan into well … a comic-book character. The story is only a pedestrian reshuffling of typical genre trappings – witches, demons etc – that feels like a Dungeons and Dragons adventure with the cast merely moving in a straight-line from one encounter to the next. Moreover, despite what the film’s vandalistic title suggests, this is a severely watered down Conan. All the primal violence of John Milius’s vision in the first film has been replaced by a two-dimensional comic-book tone. 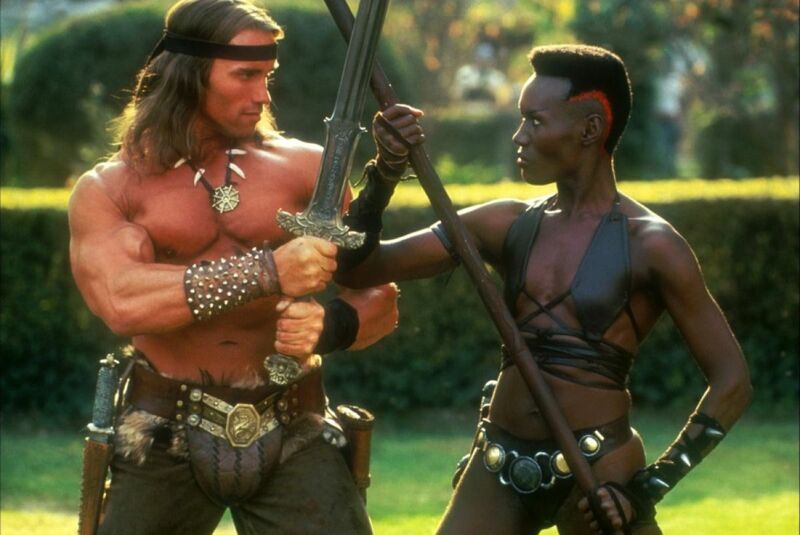 Indeed, Conan the Destroyer received a PG rather than an R-rating like the original. All the primality and brutality that essentially is Conan has been sacrificed. In Arnold Schwarenegger’s performance, which had yet to develop the tongue-in-cheek audience rapport it would with later action film stardom, Conan is a dumb brute whose intelligence seems down around the single-digit level. The rest of the characters fare little better – there are some awfully mawkish scenes regarding the princess’s sexual awakening and infatuation with Conan. Both Tracey Walter and Mako give embarrassing performances. The one good aspect of the film is the presence of singer Grace Jones in one of the handful of film appearances she made in the mid-80s. Grace Jones is not a particularly good actress but whenever she is on screen projects a raw savagery – she is like a wild animal that needs to be caged. Although the filmmakers, as though seemingly somewhat daunted by such a strong female presence, have to dumb her down with a sexist scene where she screams at the sight of a mouse. After Conan the Destroyer, a third Conan film was toyed with for a number of years but never emerged. There was eventually the dismal Conan the Barbarian (2011) starring Jason Momoa. Other Conan works include Conan the Adventurer (1992) and Conan and the Young Warriors (1994), two animated tv series that reduced Conan to a teenage adventurer; and a terrible short-lived live-action German-made tv series Conan (1998), where Conan was played by dull muscle-builder Ralph Moeller. 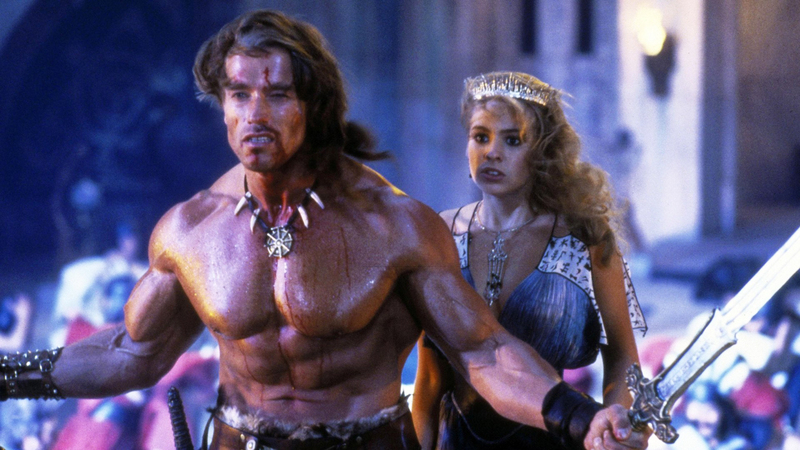 Other Robert E. Howard film adaptations are:– Red Sonja (1985), featuring Brigitte Nielsen as Howard’s larger-than-life female warrior and Arnold Schwarzenegger as a different barbarian character; Kull the Conqueror (1997) and Solomon Kane (2009).